Experience an Aboriginal Welcome to Sydney and follow a living Dreamtime cultural trail visiting sites of significance across Sydney. 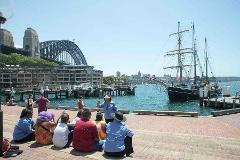 Experience first hand Sydney's ancient heritage. Tour includes a delicious Aboriginal picnic lunch. This inspiring and enlightening bush walk into the Dreamtime will give a deep understanding of the local Dharug tradition and culture. boriginal art goes far beyond the beautiful and meticulously done dot painting. We’ll dig deep into dot painting as well as the wealth of other forms taken by Aboriginal Art while exploring Brisbane’s cultural epicentre. Experience the only interactive Aboriginal Live Theatre Show of its kind! Song, dance, storytelling, and ritual unite in Spirits of the Red Sand, an interactive theatre experience that brings to life the history of Australia. On this 3-hour walking tour around Brisbane’s River, delve into the city’s wealth of Aboriginal art and culture. Brisbane is home to one of the most diverse collections of Aboriginal public artworks in Australia. Take advantage of this unique opportunity to immerse yourself in Aboriginal art and culture with the help of an Indigenous guide! Led by an expert Aboriginal guide, learn about the diverse and vibrant Indigenous cultures of Australia, discover their rich traditions of performance and storytelling, and see artwork set against a powerful history of survival. xperience the world’s oldest living culture firsthand in a greenery-filled haven with a free self-guided tour or a guided tour with our expert cultural interpreters. Participate a variety of fascinating traditional activities. Our most popular tour 1.5 hour walking tour Led by Aboriginal guides Uncover the most ancient human culture on earth during this 90-minute walkabout in The Rocks with your local Aboriginal guide. Join us on a cultural quad biking adventure like no other! Get a glimpse of an First nationsAboriginal’s perspective in Sydney!